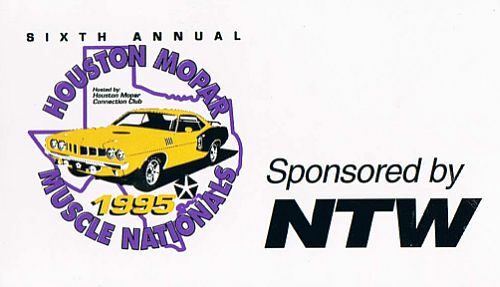 Below are just a few of the previous fun Houston Mopar Connection Club activities in the years since the early 1990's! 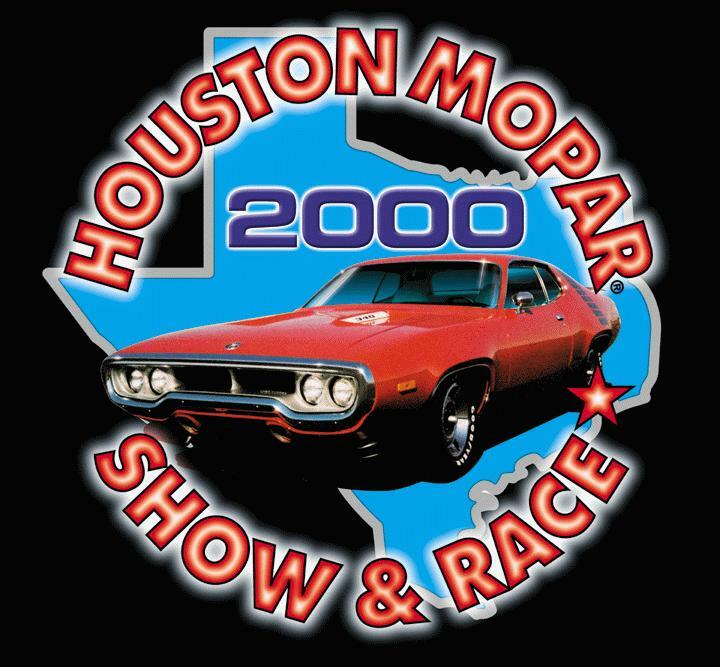 The 1999 Houston Mopar Show and Race! fearturing approximately 300 Mopars racing and showing off in the car show! The HMCC at the November, 1999 Houston AutoRama! July 8 -- San Jacinto Picnic. July 15 -- Show and Shine at River Oaks. 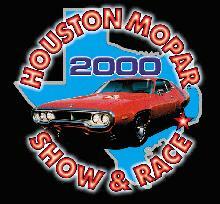 September 23 -24 -- The 2000 Houston Mopar Show and Race Way cool! The Mopar excitement was GREAT! took place September 23rd and 24th, 2000 at Houston Raceway Park. The Nickens Brothers Racing Team showed up! Scott Geoffrion and Darrell Alderman were out testing the cars, and raced each other! They had a big trailer in the race sataging area and met with Mopar fans. We had over a $5000 Race purse and over 70 trophies in every category you can think of, including Dakota trucks! The Houston Food Bank will benefit from a donation we will make to them from revenue generated at the Show ansd Race. Check out the 2002 Show and Race pictures! 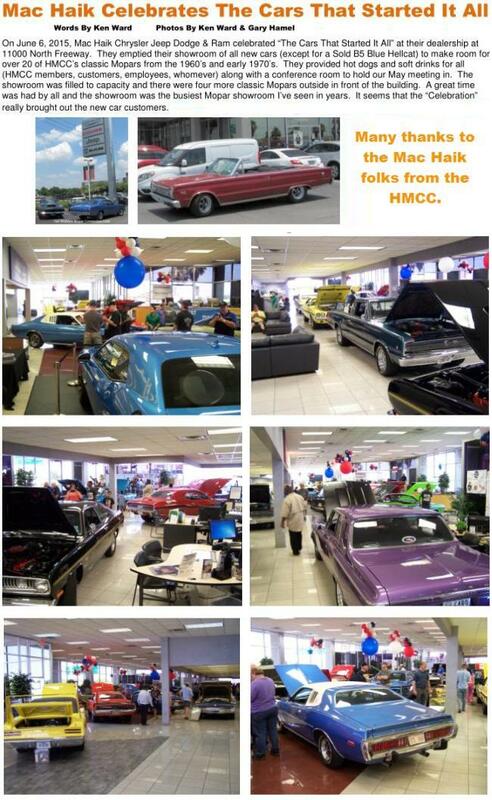 View pictures from the HMCC's 2001 Houston Mopar Show and Race at Houston Raceway Park! 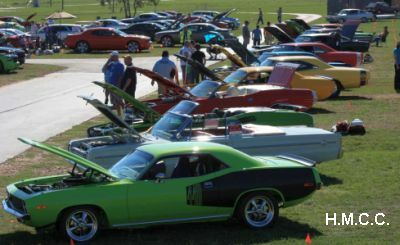 The 2002 13th Annual Houston Mopar Show and Race at Houston Raceway Park was fantastic! Thanks to all who helped make this event successful! Precision Engine Rebuilders was a sponsor of the 2002 Houston Mopar Show and Race at Houston Raceway Park. The Space City Cruisers Show on April 19, 2003, held at League City Park. 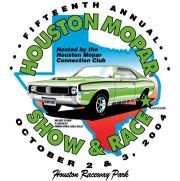 October 4 and 5, 2003 -- 14th Annual Houston Mopar Show and Race at Houston Raceway Park was the biggest show yet! Check out some pictures taken at the 2003 Show and Race! Photos from Las Vegas 2006 Mopars At The Strip, courtesy of H.M.C.C. member Alex Tennyson. held on October 25th was a huge success! Click Photo to See More Pictures! February 14 17th Annual Hill Country Vallentine's Tour. April 25 The Annual Mopar Club's Picnic in Bastrop, TX. December 13 The Houston Mopar Connection Club's 2009 Christmas Party at Hickory Hollow Restaurant. 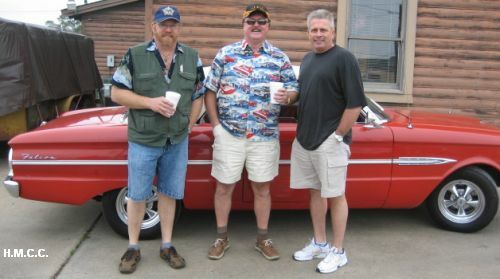 Photos from a 2010 / 2011 calendar that featured club member's Mopars. 2010 Aeros and Autos Car Show at Ellington Field, on May 8, 2010. 2010 DeMontrond Show and Shine at DeMontrond Chrysler Dealership in Conroe, TX on May 22, 2010. Gillman Chrysler/Dodge Car Show at the new Gillman Chrysler Jeep Dodge dealership on the corner of Beltway 8 and Southwest Freeway (10585 West Sam Houston Pkwy) on August 21, 2010. Photos from Troy Hawkes -- Photos from James Thames. 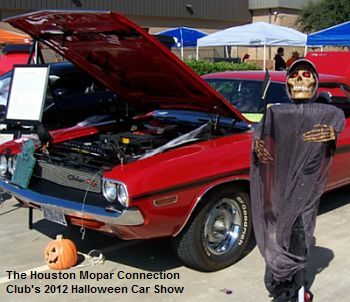 October 23 - The Houston Mopar Connection Club's 3nd Annual Halloween Car Show was GREAT! Over 130 vehicles were entered and we had rain-free weather. A good amount of money was raised for charity. THANKS for your support! View Pictures! December 7 - The unveiling of the 2011 SRT8 (392 HEMI) Challenger, and Charger R/T! 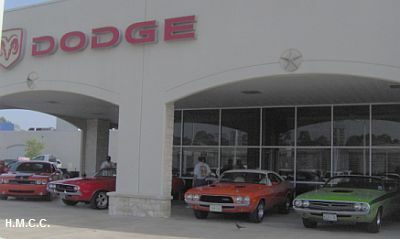 Thanks to Allen Samuels Katy Dodge, and the Space City LX Modern MoparClub! Channel 39 TV broadcast from their Anything That Rolls show coverage at The First Annual Andrew Erickson ALL MOPAR Memorial Car Show in Katy at Allen Samuels Dodge. April 23, 2011 - Annual Mopar Clubs Picnic in Bastrop Texas. Photo courtesy of the San Antonio Mopar Club. April 30, 2011 - HMCC Members at the 20th Annual (and final) Budweiser Brewery Car Show. Thanks to James Thames for the photos! May 21, 2011 - Club members and Mopars at the 1st Annual Houston Area Construction Industry Auto Show Thanks to James Thames for the photos! September 3, 2011 - Houston Mopar Club Members at the 27th Annual Southwest Mopar Mini-Nationals, help by the Dallas Mopar Club. October 22, 2011 - Houston Mopar Connection Club's 4th Annual Halloween Classic Car Show! See a short video overview of the packed show parking lot! 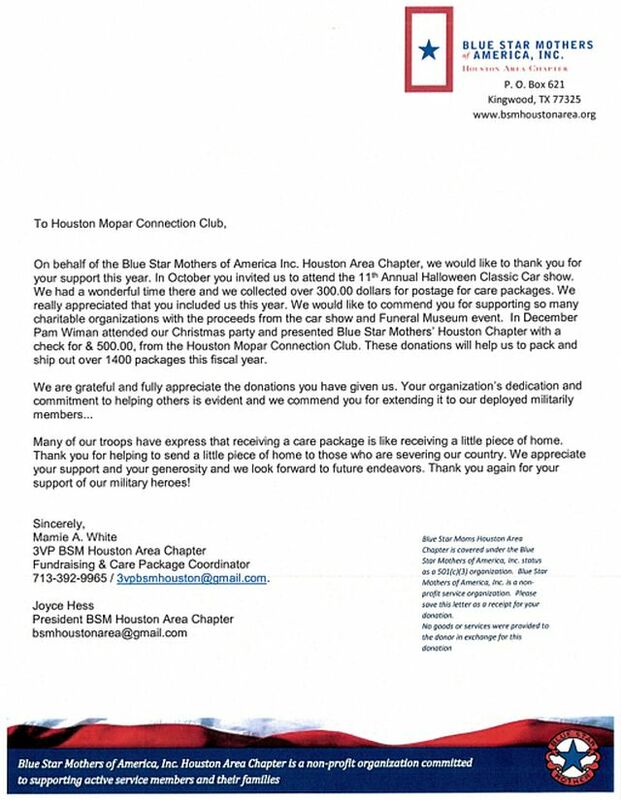 Charities Acknowledge Support by Houston Mopar Connection Club's 2011 Halloween Car Show! December 12, 2011 - Houston Mopar Connection Club members at the Christmas Toy Drive held at The Brickhouse Tavern on Highway 290 in Houston. Candace, Vickie, and Kody at DJ Table / Gary Jones with gift box / and Best of Show 1967 Camaro. May 19, 2012 The 2012 Houston Construction Industry Auto Show. Photos from H.M.C.C. member James Thames. See more photos at West Houston Muscle. May 12, 2012 Several club members attended the 2012 Aeros and Auto Show at Ellington Field. July 20, 2012 H.M.C.C. supports the aniMeals Charity. 5th Annual Halloween Classic Car Show! 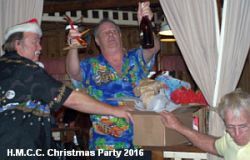 The 2013 Houston Mopar Connection Club's Christmas Party. 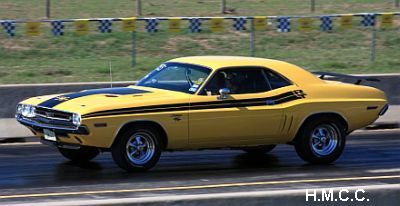 Condolences from the Houston Mopar Connection Club to the family of Jerry Tomasello of the Blast from the Past Street Machines of Texas. Jerry passed away December 8, 2013. R.I.P. -- View Memorial Information. 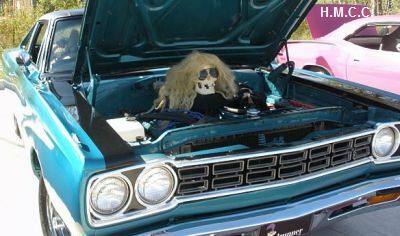 October 26 - The 6th Annual Halloween Classic Car Show was great! THANKS for your support to make the show a success and help charities: The Star of Hope, The DePelchin Children�s Center, The Houston Food Bank, USO, Harris County Sherriff Department Teddy Bear Program, and The Shriner's Burn Hospital. THANKS to the 2013 show sponsors and vendors. 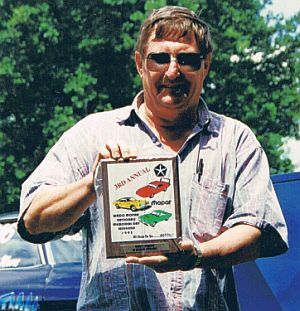 On May 27, 2013 long-time Houston Mopar Connection Club Member Jim Poncik passed away peacefully with the family by his side. A memorial Celebration of Life for Jim was held June 9. As seen in Mopar Collector's Guide magazine. A H.M.C.C. Members and Family celebration of life for Woody was held on March 9 at the monthly club meeting. In Memoriam March 2014: Our condolences to club member Matt Clark on the passing of his wife Jodie Karen Lowry-Clark Her journal is online for viewing. The October 25, 2014 7th Annual Halloween Classic Car Show was GREAT! View photos taken at the show. The 2014 Annual Halloween Classic Car Showwas sponsored by Jones Hydraulic Service. As a result of the people who supported our 2014 Halloween Car Show and the club members who helped make the show happen, over $7,000 was donated to many non-profit organizations, including: the Houston Food Bank, Star of Hope, Shriner's Children's Hospital, Depelchin Children's Center, Harris County Sheriff's Reserve Teddy Bear / Easter Bunny program, Animeals, and the McPherson College Scholarship Fund. January 1 - In Memoriam -- Rest in Peace. Houston Mopar Connection Club member Kenneth Smerek passed away January 1, 2015. January 28 - Posted photos from a 2010 / 2011 calendar that featured club member's Mopars. October 24 - The 8th Annual Halloween Classic Car Show was rained out and held on March 12, 2016 as a combination Easter / Halloween show, or Easterween event. August 18 Service - In Memoriam -- Rest in Peace. 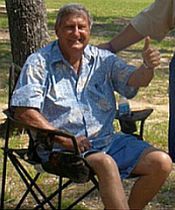 Guest book and obituary for former Houston Mopar Connection Club Treasurer Marvin Walton.